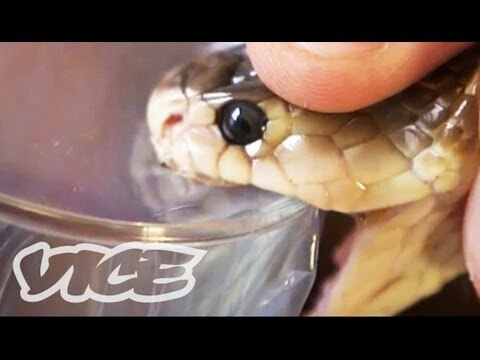 Vice met with a guy who has been injecting himself with snake venom for 20 years, and surprisingly he is looking better than ever. The hemotoxins which attack our blood cells in a tree viper’s venom can result in an agonising death in less than 30 minutes. The neurotoxins in a cobra bite can kill a person in half the time of a tree viper’s venom. But for Steve Ludwin he’s has been sticking all this lovely deadly snake juice in a syringe and mainlining it all the way to immortality. Steve has been privately milking an array of deadly snakes including rattlesnakes, monocled cobras, and a few casual vipers thrown in to the mix, he’s been injecting what would for any normal human be fatal amounts venom. Bill Haast who produced snake venom for medical and research, laid out the basic principle – regular exposure to the venom results in the body developing an immunity. Steve claims he never gets ill, and that cobra venom is the ultimate pick me up, with effects lasting a days after injecting, making him stronger, faster and more resilient. What would be interesting is seeing if his antibodies could help others? and How his blood makes the anti bodies. ?His skin looks exceptional for someone over 40 and no dark circles under the eyes. – amazing. The body has an immune system that is designed to combat toxins,viruses etc,.. snake venom sounds like it makes the immune system work hard and quick in a positive way. If China used snake venom on their race horses you know there is something is this. BUT anything that does not conform to the Drug industry will get sidelined and ridiculed.